“You wouldn’t have your doctor design your car, so why would you have engineers design your food? Genetically modified organisms (GMOs) are one of the most dangerous and radical changes to our food supply. Genetically modified plants are artificially inserted with genes from other animals, bacteria, viruses, insects and even humans that would never mate in nature, to obtain a desired effect. 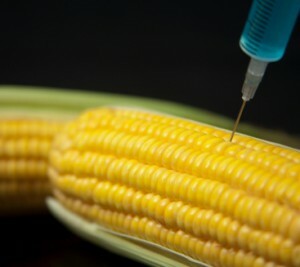 For example, corn is inserted with a pesticide producing gene from bacteria. So when a pest bites into the corn, the pesticide is produced and kills the pest. So what happens when we bite into the corn? Myth: Genetically modified foods are safe and have been fully tested. At medical conferences around the US, doctors are citing a huge increase of gastrointestinal problems among their patients over the last decade. GM foods may be the answer why. *More vulnerable to infection and disease. *Organs related to the immune system, the thymus and spleen, showed some damage as well. *GM-fed rats had smaller, less developed brains, livers and testicles. *Other rats had enlarged tissues, including the pancreas and intestines. *Some showed partial atrophy of the liver. *Significant structural changes and a proliferation of cells in the stomach and intestines of GM-fed rats may have signaled an increased potential for cancer. During a study involving female rats, Roundup Ready soy was given starting before conception and continuing through pregnancy and weaning. *Of the offspring, 55.6% died within three weeks compared to 9% from non-GM soy controls. *When the offspring from GM-fed rats were mated, they were unable to conceive. *When rats were fed Mon 863 (GM corn), they developed several reactions, including those typically found with allergies in response to infections, toxins and various diseases including cancer, anemia, and blood pressure problems. The main foods to watch out for are non-organic corn, soy, canola, and cottonseed. GM rice, wheat, tomatoes, sweet corn, potatoes and popcorn have all been rejected as unacceptable in the global marketplace. Eat in: Restaurants are the most common places to find GMO’s. Ask for your meal to only be cooked with olive oil, not canola oil. Ask which meals do not contain corn or soy. Read labels: Organic is the only 100% way to avoid GMO’s. When reading labels, look for “Does not contain GMO’s.” GMO’s may be found in soy flour, soy protein, soy lecithin, textured vegetable protein, corn meal, corn syrup, dextrose, maltodextrin, fructose, citric acid and lactic acid. Shop at Farmers Markets: Buying local food ensures purity from many GMO contaminates, is more affordable, organic, and higher in nutrients. Buy Grass-Fed Meat, Wild Fish and Organic Eggs: Visit www.grasslandbeef.com and www.eatwild.com for a list of grass-fed farms in the U.S. and Canada. Glucose: a simple sugar that can be naturally derived or chemically made from corn. Lecithin: An emulsion derived from soy and can be found chocolates, ice creams, desserts and supplements that don’t use organic sources. Maltodextrin: An additive made from starch (usually corn) used as a fat substitute, flavor stabilizer, and thickening agent found in instant soups, soda, candy, beer and other processed goods.